[I]n our domestic capacity, with the suckling at the breast, and the stripling at the hand, the air they inhale shall be filled with the principles of reform. These were the words of Halifax’s Female Reformers, read aloud at a public meeting on Skircoat Moor held less than two months after the Peterloo Massacre. The resolutions marked the occasion when, on 16 August 1819, a large-scale demonstration in Manchester to call for political reform was violently dispersed by military force, resulting in the deaths of 18 people and injuries to several hundred more. The event’s main speaker, the radical Henry ‘Orator’ Hunt, was arrested along with the other speakers on the hustings, and in the weeks that followed a number of prominent radicals were also imprisoned, accused of conspiring to overturn the government. Almost immediately following the Massacre, the magistrates who had ordered the meeting’s dispersal took control of the narrative of events, claiming that they had taken the necessary steps to control a revolutionary mob. Following public praise from both the Cabinet and the Prince Regent for so doing, the ‘official’ version of Peterloo was further safeguarded by the passing of the ‘Six Acts’ in 1820, which included a tightening of the laws on sedition and libel and restrictions to the right of public protest. 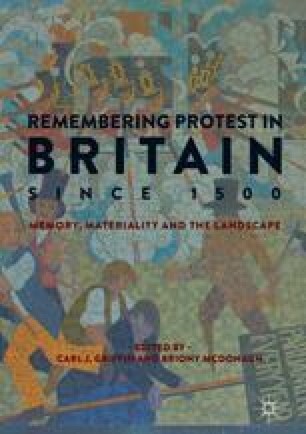 It is in this context that this chapter examines the ways in which radicals memorialised Peterloo, establishing a counter-narrative of a peaceful demonstration brutally interrupted by a vicious militia on the orders of corrupt local officials. The assertion of this alternative version of events was in itself a form of protest, as well as a means of sustaining a beleaguered movement through the most difficult of times.